Enhanced employee tax benefits, resulting in more dollars for relocation. 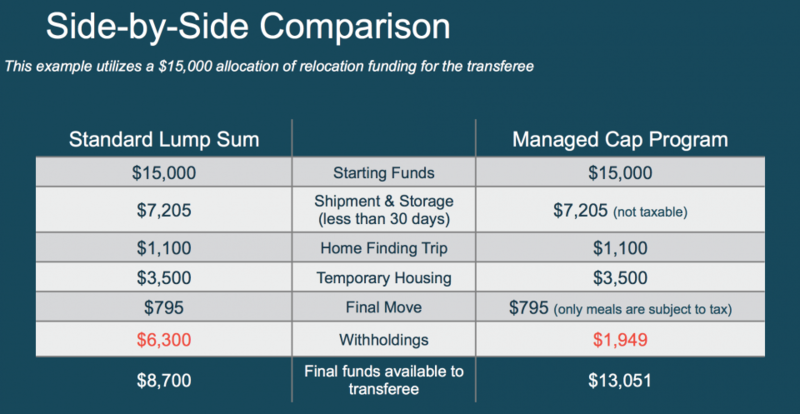 The Managed Cap Program provides the transferee with $4,351 more for relocation services! A Managed Cap program will ensure that your transferees get the most out of their relocation dollars and that you will reduce the amount of administrative burden dealing with exceptions. Global Mobility Solutions – a leader in mobility management since 1987 – has expert relocation consultants who understand how a Managed Cap program can benefit you and your company. Contact Global Mobility Solutions and learn how we can quickly implement a managed cap program custom-tailored for your needs. Request your complimentary managed cap program demo to see how much you can be saving.